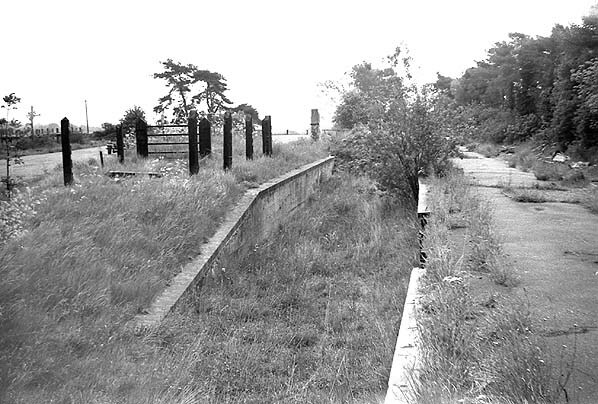 Present state: The station site is now a wood yard (Kent Woodware Company), The main building was demolished in the late 1960's but the platform survives in a dilapidated state. The engine shed, goods shed and signal box all survive in good condition. The signal box is still in Southern Railway colours and retains its green and white sign. From the outset all train services were operated by the South Eastern Railway, though the Cranbrook and Paddock Wood Railway was not officially absorbed until 1900. The SER and the LCDR combined in 1899 under agreement that both companies would retain their independence while being administered under a management committee operating as the South Eastern & Chatham Railway. The LCDR was itself incorporated into the Southern Railway under the 1923 grouping and finally British Railways after nationalisation in 1948. From the offset traffic on the line was light, due in part to the inconvenient locations of stations. Extra traffic was generated during the hop picking season which, at its height, brought up to 26 special trains a day with each train carrying up to 350 people. By 1959 this traffic had declined and the line was carrying less than 200 passengers a day, many of them children. The final blow came when the local education authority took out a contract with the Maidstone & District Motor Company to transport the children by bus. Despite rumours of electrification, closure was announced and the line finally closed on 12 June 1961. 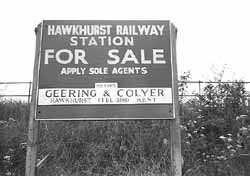 Hawkhurst Station was over a mile from Hawkhurst, it had a single platform on the down side of the line with a short bay with a run-round loop with a water tower and signal box and a short spur to an engine shed on the south side. The single storey station building was clad in corrugated iron, similar to the other buildings on the branch. There was a two road goods yard, loading dock and a brick good shed on the north side of the station. 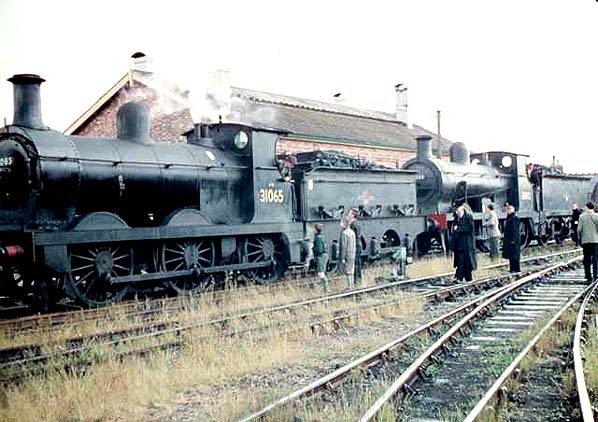 Hawkhurst Station during the 'Farewell to Steam' railtour on 13.6.1961. The engine shed can be seen to the rear.